When I posted this entry last week, some readers drew an equivalence between the toy guns for sale in Gaza and the toy guns for sale in American toy stores. When American kids play “Cowboys and Indians” with the toy guns they receive for Christmas, you don’t see real masked terrorists hanging around. A Palestinian boy stands with his toy gun next to a masked Palestinian gunman from the militant group Hamas in the area where an Israeli Army bulldozer was demolishing a structure near the border with Egypt, in the Rafah refugee camp, southern Gaza Strip, Saturday, Nov. 29, 2003. The “toy gun” this boy is brandishing is practically indistinguishable from a real handgun. 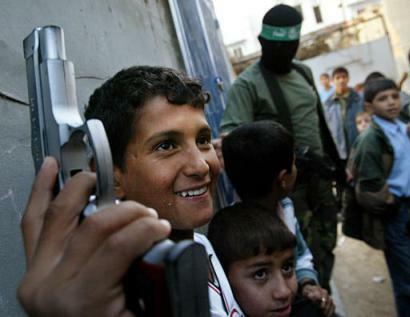 What kind of parent lets their child go out and play with realistic toy guns in an area where the Israeli Defense Forces are carrying out an operation, and hang around with masked killers armed with real weapons? Silly me. A Palestinian parent does this. If the child is shot by the IDF, either in the mistaken belief the gun is real, or in an attempt to take out the Hamas murderer using these children as human shields, where’s the downside? The child is shaheed and goes immediately to heaven, and the Palestinians get another propaganda club with which to beat the Israelis when the international media screams about another Palestinian child killed by the IDF.